More than 100 invited guests - including the Mayor of Peterborough John Peach who cut the ribbon to mark the occasion - attended the opening night of the new Ba Shoh Indian restaurant on Broadway on Friday. 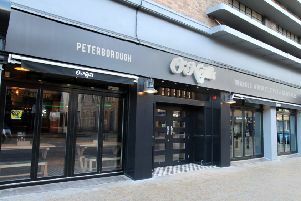 The stunning redevelopment of the former Imperial Bento restaurant also saw guests entertained by traditional drummers and Bollywood dancers as well as sample a selection of dishes served buffet-style from the 200-seat a la carte restaurant which went on to open for business to the public the following day. Openijng of the Ba Shoh restaurant at Broadway. The five month revamp of the one-time City Library will see the plush, stylish banqueting suite on the first floor completed within days, before the next phase of work sees the adjoining former Bar Fever nightclub ground floor premises converted to a grill and dessert lounge. Openijng of the Ba Shoh restaurant.